As renewable energy production has surged in recent years, opponents of government policies that have helped spur its growth have pushed to roll back those incentives and mandates in state after state. On Wednesday, they claimed their first victory, when Ohio lawmakers voted to freeze the phasing-in of power that utilities must buy from renewable energy sources. The bill, which passed the Ohio House of Representatives, 54 to 38, was expected to be signed into law by Gov. John R. Kasich, who helped negotiate its final draft. It stands in marked contrast to the broad consensus behind the original law in 2008, when it was approved with virtually no opposition, and comes after considerable disagreement among lawmakers, energy executives and public interest groups. Opponents of the mandates argued, in part, that wind and solar power, whose costs have plunged in recent years, should compete on their own with traditional fossil fuels. But the debate has taken on a broader, more political tone as well, analysts say, with disagreements over the role of government, the economic needs of the state and the debate over climate change. Since 2013, more than a dozen states have taken up proposals to weaken or eliminate green energy mandates and incentives, often helped by conservative and libertarian policy or advocacy groups like the Heartland Institute, Americans for Prosperity and the American Legislative Exchange Council. In Kansas, for example, lawmakers recently defeated a bill that would have phased out the state’s renewable energy mandates, but its backers have vowed to propose it again. The Ohio bill freezes mandates that require utilities to gradually phase in the purchase of 25 percent of their power from alternative sources, including wind, solar and emerging technologies like clean coal production, by 2025. While the freeze is in effect for two years, a commission would study the issue. At the federal level, alternative energy industries like solar and wind have pushed hard in recent years to preserve important tax breaks that they say have helped spur new development and sharply increased the supply of clean energy flowing into the grid. But the demand for that energy has been largely propelled at the state level by mandates, known as renewable portfolio standards, that generally set goals for utilities to increase the percentage of green energy they include in the power they buy for their customers. Roughly 30 states have the standards, which can range from modest voluntary goals like Indiana’s target of 10 percent by 2025 to more aggressive requirements like Hawaii’s, which aim for 40 percent by 2030, according to the Department of Energy. In Ohio, where opponents of the mandate argued that it raised the price of electricity and supporters worried about the loss of economic development and jobs, Mr. Kasich worked to broker the compromise bill, said a spokesman for the governor. But Gabe Elsner, executive director of the Energy and Policy Institute, a pro-renewables group that sees efforts to weaken incentives and mandates as part of a campaign by utility and fossil fuel interests, said the temporary halt could do away with the law entirely. Renewable energy still represents a small fraction of the overall energy mix, reaching about 6 percent of net generation in 2013, according to the United States Energy Information Administration. But it is on the rise, representing 30 percent of power plant capacity added that year. 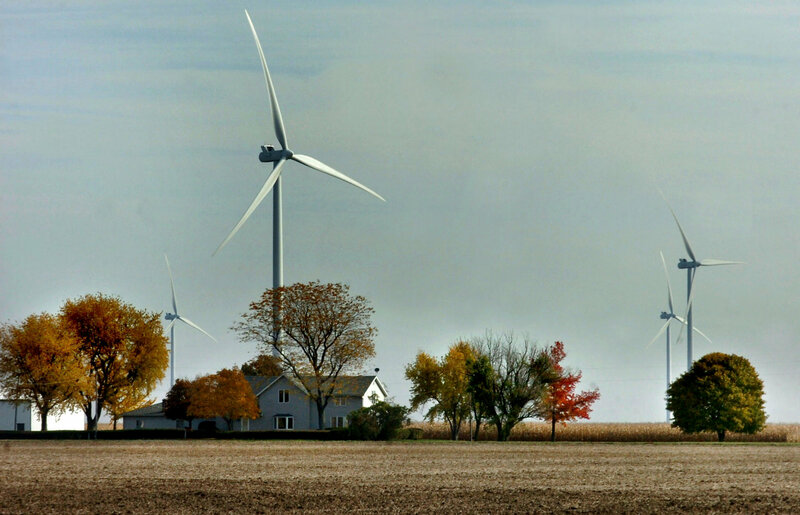 For renewable developers, the outlook is uncertain. Michael Speerschneider, chief permitting and public policy officer for EverPower, which recently won approval to develop a 176-turbine project in Ohio, said the ruling would make it more difficult to find a buyer for the power, dimming prospects for doing business in the state.